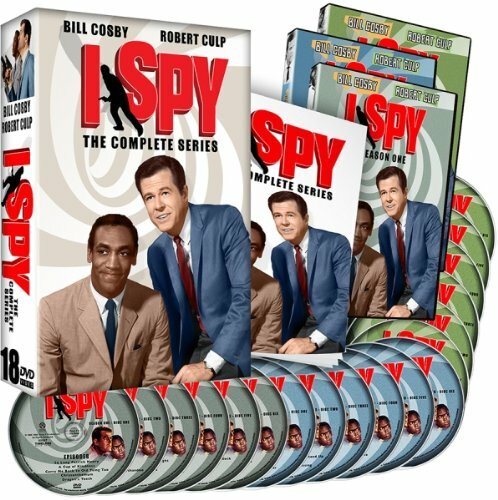 Travelling to exotic locales while posing as a tennis pro and his trainer, intelligence operatives Kelly Robinson (Robert Culp) and Alexander Scott (Bill Cosby) take on the espionage community with both grit and lighthearted banter in I Spy: The Complete Series . On June 24th, 2014, join two of the hippest secret agents in television history on their globe-trotting adventures with the release of I Spy: The Complete Series from Timeless Media Group. This 18-DVD box set contains all 82 episodes of the award-winning series, and is the first time the show has been available as a complete series set. Originally broadcast on NBC from 1965 to 1968, this groundbreaking hit series was also critically acclaimed, winning numerous awards including 1967 Golden Globe(R) for Best Dramatic Series, three consecutive Primetime Emmy(R) Awards for Outstanding Lead Actor for Bill Cosby and the Primetime Emmy(R) for Outstanding Musical Composition for Earle Hagen. Robert Culp was nominated for a number of Primetime Emmy(R) Awards, including three Outstanding Lead Actor nominations and one for Outstanding Writing Achievement in Drama. Beloved by fans today thanks in part to the unmatched chemistry between its stars, I Spy: The Complete Series also features memorable guest-star performances from Gene Hackman, Jim Backus, Ron Howard, Boris Karloff, Martin Landau, George Takei, Don Rickles and Eartha Kitt, who was nominated for a Primetime Emmy(R) for her role. Timeless Media Group, a division of Shout! Factory, LLC, produces and distributes a variety of home entertainment products, including classic television programming, first run movies and its own award-winning military history documentaries, along with an extensive offering of special interest DVD and Blu-ray(TM) collections. Visit timelessvideo.com.